Brendan Rodgers played down the significance of a landmark result in his Celtic managerial tenure as he admitted his team delivered one of their least impressive displays of the season, despite stretching their lead at the top of the Premiership to 11 points. Leigh Griffiths scored the only goal of a largely forgettable contest against Hamilton Accies at Celtic Park, which extended Rodgers’ unbeaten record in domestic competition to 19 matches – the best start by any Celtic manager. 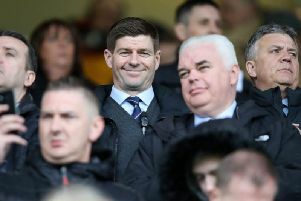 But he insisted the record was of little significance, instead praising his players’ mental strength on a night when he cited the Parkhead playing surface as a factor in their failure to find their best form. “It doesn’t hold any weight at this point,” said Rodgers, pictured. “It is a good win and it is very nice. It is a great mark of the players; concentration and how relentless they have been, their drive to keep going. Throughout most of this season, we have played at a very high level. In some games we haven’t and tonight was one of those games where we didn’t hit the heights, which is sometimes understandable with the number of games we are playing. But we showed great desire and persistence to keep going. Hamilton were very well organised.